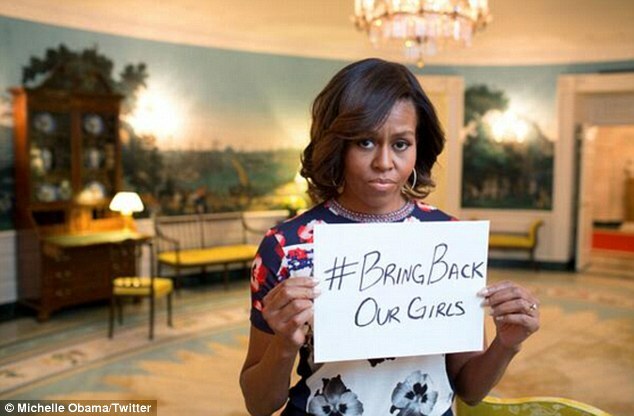 That’s the wife of the leader of the free world holding up a sign for Twitter. In the history of empty gestures, this ranks near the top. We’re the most powerful nation in history and we’re reduced to holding up signs? You may recall that prior to 9/11 there were online petitions being circulated protesting the mistreatment of women in Afghanistan. I received one that had several hundred names attached. Oh, how good it must have felt to taken such a brave and moral stand. But it was all just barking at the moon. When Bush ordered the invasion after 9/11, women did get their rights restored. The right to vote, hold office, go to school, to work etc. Did the pious lefties credit Bush for that? As for Boko Haram, perhaps then Secretary of State Hillary Clinton took advice from her hubby when she refused to label them terrorists. What, in hindsight, can be only described as an obtuse and extremely wrong statement, former President Bill Clinton stated in 2013 that the terrorist organization Boko Haram acts out of poverty, not because of religious fervor. Mr. Clinton not only stated that poverty was the cause, but that specifically, Islam and religion could not be blamed in any way. Clinton would go on to suggest that divvying up natural resources differently in Nigeria and offering Boko Haram jobs could help stop their terrorist attacks and kidnappings.